Crying is a baby’s principal means of communicating its negative emotions, yet no matter how annoying and painful it may be to hear those high pitched screams, humans are naturally drawn to this call. Well, it seems our brains are hard-wired to respond strongly to the sound, making us more attentive and priming our bodies to help whenever we hear it. A new study by biologists at the University of Winnipeg, Canada suggests that this isn’t a solely human trait. Their findings suggest there’s a common element among the cries of most, if not all mammalian species that draws adults to investigate as a primal instinct, ignoring any risks in between. Susan Lingle, a biologist at the University of Winnipeg, and colleagues recorded the calls made by infants from a variety of mammal species when separated from their mother or otherwise threatened. These were then played our in the Canadian prairies from hidden speakers to wild mule deer (Odocoileus hemionus). 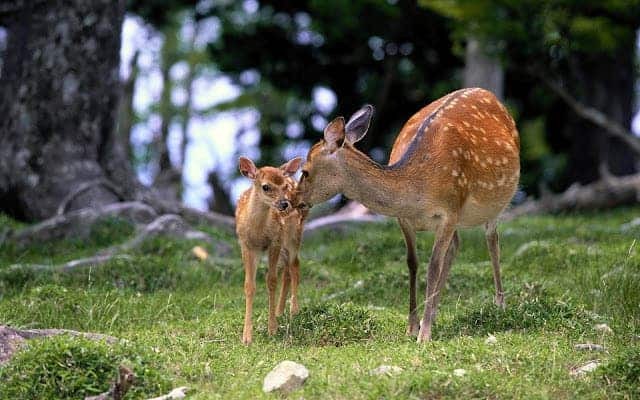 The researchers noticed that mother deer quickly moved towards the source of the sound when the cry of an infant deer was played, but same held true whether the cries came from infant fur seals, dogs, cats or humans. All these species call at roughly the same high pitch. Even the ultrasonic calls of infant bats attracted the mother deer, of course after being tuned to a lower frequency using software. The findings suggest there’s a common acoustic element that some mammals are hard-wired to respond to and investigate, at the cost of taking risks. It may be that this common element was kept across species, even in those whose lineages separated more than 90 million years ago. Findings appeared in the journal American Naturalist.